Pay for two nights and get the third night free. So two nights at R6000.00 per night costs R12 000.00, then stay for the third night at absolutely no cost. A huge saving of 33% for stays in February 2019. 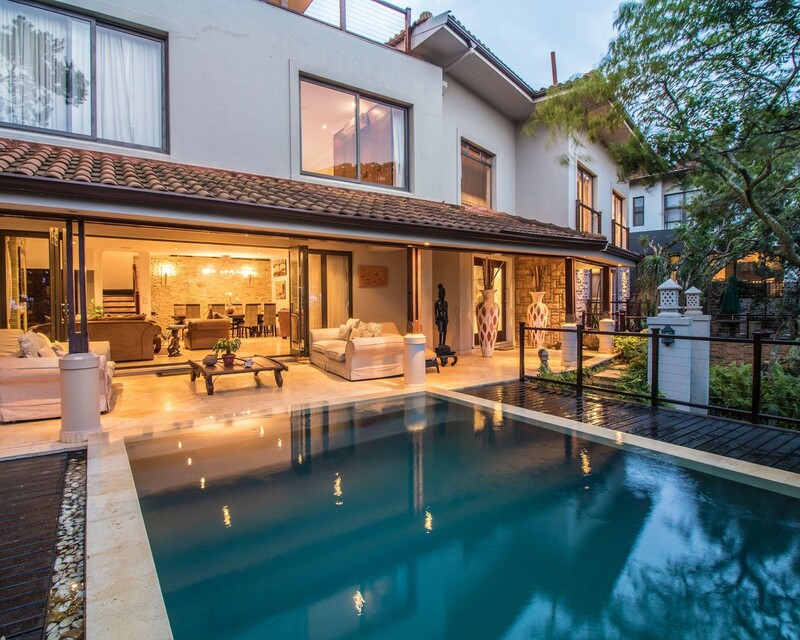 This is a spacious 5 bedroom home in the road closest to the Zimbali beach with sea views. This home has two lounges, one which overlooks a tranquil Koi pond, the other overlooks the private swimming pool and extensive outside living areas. The impressive master suite has a large walk in dressing room. The designer bathroom, steam room and outside shower area are spacious. Bedrooms 2, 3 and 4 occupy the same level as the master suite and share 2 bathrooms between them. There is a TV room on this level too. A third top level is an extensive living space incorporated with the 5th bedroom, bar, large under-cover patio and jacuzzi. Sea and forest views are visible on all sides. The kitchen is large and has all amenities. Golf Cart included, as well as access to the amenities of Zimbali Coastal Resort. No Smoking Allowed. Toilet paper, dish washing soap and black bags provided on arrival.